What do you do when all of your nearest and dearest are away on holiday? Spring clean the house from top to bottom, watch endless reruns of Jeremy Kyle, devour book after book? Answer; anything. You do what makes you happiest -because, after all, you’ve only yourself to please. This bank holiday, I’ve spent some time pottering in charity shops. 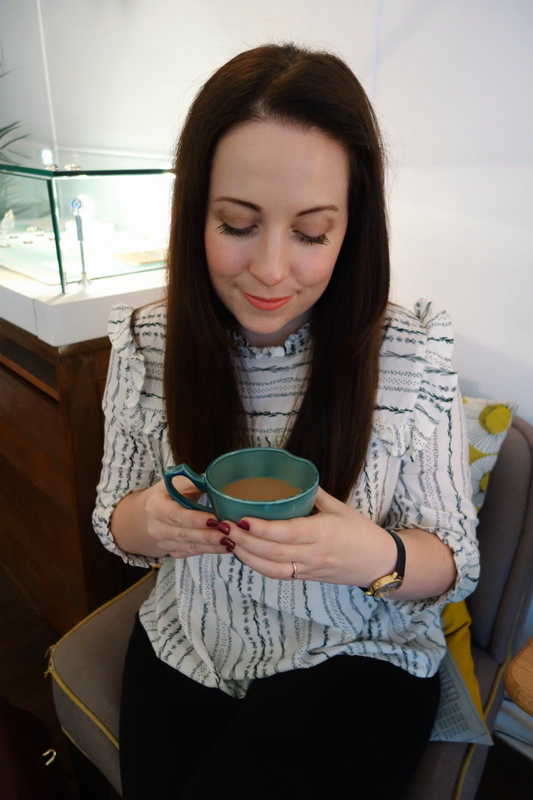 Usually, I’d wait to show you each item styled in an outfit post, but as I’ve started to enjoy reading about the finds of other bloggers, I thought I’d share my weekend finds too. On Saturday, after enjoying a lie in to be proud of, I decided to drive 19 miles from St Helens to Southport. My main intention was to visit their charity shops after seeing the luck Charlotte had this week. However, I wanted to find that button down Primark a-line denim skirt and somewhere in the plan was a trip to Caffe Nero and packet of dunkable ginger biscuits. (Like I said, you do what makes you happiest.) Whilst I wish I could bring you news of great fortunes in Southport, my summertime childhood stomping ground yielded only one item. One item to be thrilled with. 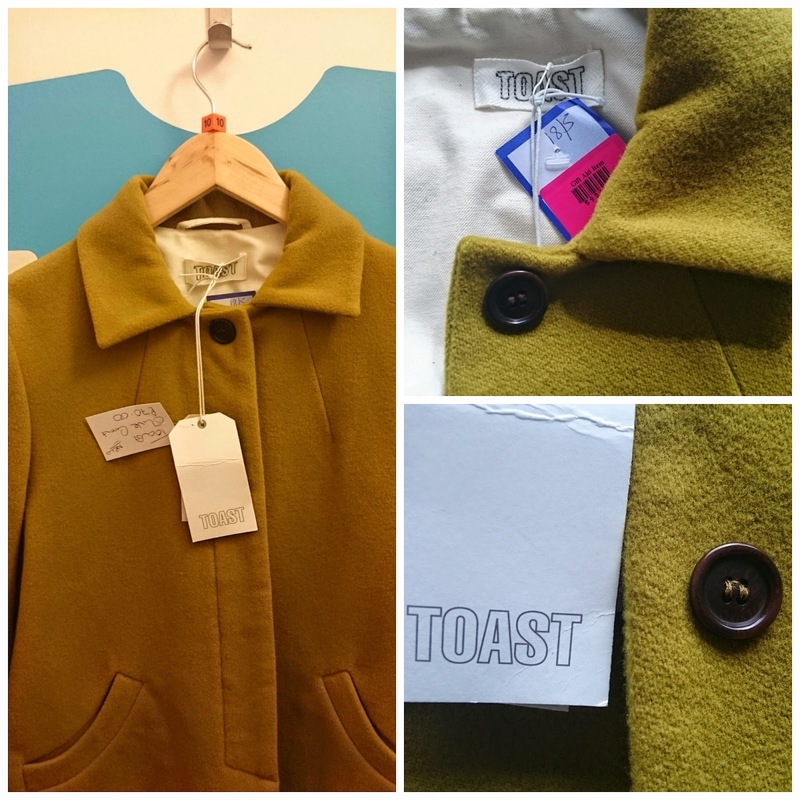 Enter, this olive green Toast jacket. Toast is a brand I discovered whilst searching for Saltwater sandals. Stocking homewares as well as fashion, their clothing range is well out of my price range. 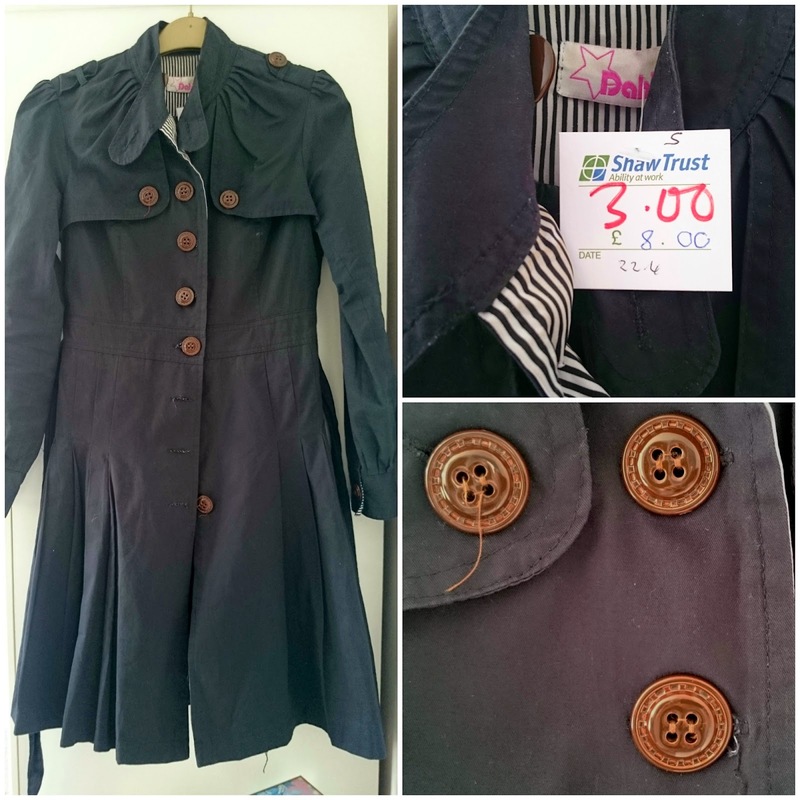 I found this jacket in Cancer Research, the final charity shop on Lord Street, and was instantly drawn by the colour. A close companion of mustard, its labelled as olive but is almost chartreuse. Trying it on with my YMC checked shirt, I loved how different in style it was to everything I own and the fact it’s 75% wool. Its original Toast price tag revealed it to have been £189, Cancer Research’s price? £12.50. After a quick trip to Primark and Caffe Nero (ginger biscuits, mmm), I returned to the car with just my one purchase. Not wanting to go home to an empty house, I drove into St Helens and tried a few of my favourite shops. It was in British Heart Foundation that I found this nautical Hobbs jumper. Sure, it’s clearly been worn before as it shows minor bobbling and the nautical nap is ever so slightly ruffled, but for £3.49 and a People Tree navy midi skirt to match waiting at home, I decided to take a chance. With a wash and press, I’m sure this jumper will see a few more wears. Completely unplanned, I woke up earlier than expected this morning and decided to nip into town to buy toiletries. Of course, when I saw the door of the Salvation Army open, I wondered what other charity shops would also be open and decided to take a stroll to the other side of St Helens. I was so pleased to see Scope open and in return, Scope had lots of treasures for me. 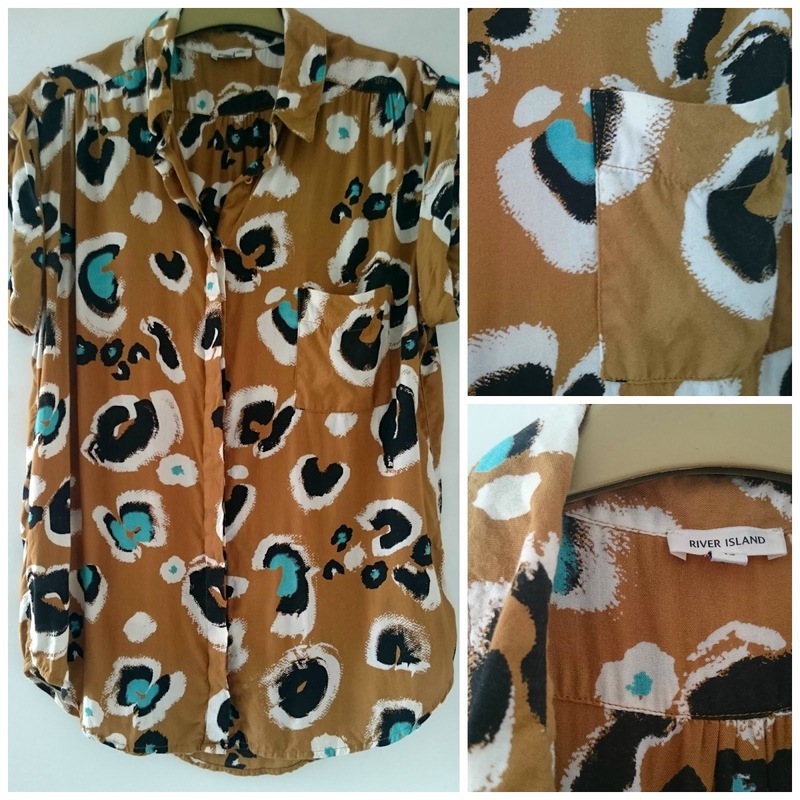 Firstly, this leopard print River Island shirt is not usually something I’d choose. Despite the fact that it was in desperate need of an iron, I was really drawn to the loose shape of it. In a 12, it’s a size bigger than I’d usually wear but it’ll be perfect with a pair of ripped black skinny jeans. At £2.95, I decided to take a gamble. Up until now, my vintage charity shop buys have been sporadic. With bloggers like Paloma in Disguise showing us how workable vintage can be, I’ve definitely been feeling more adventurous. Last summer, I bought a vintage Jaeger skirt on eBay and ever since, I’ve been drawn to Jaeger as a brand. On Saturday, I found a gorgeous striped Jaeger skirt that was just too small. 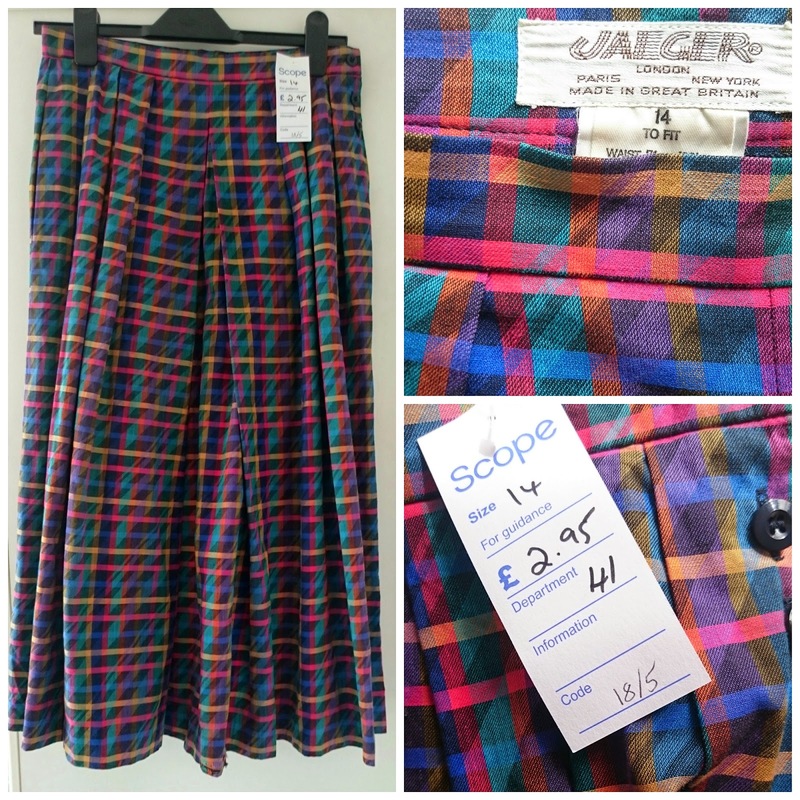 Today, I found this bright Jaeger skirt, in my size, for £2.95! Hurrah! Sure, it’s going to need work but isn’t that the joy of vintage? 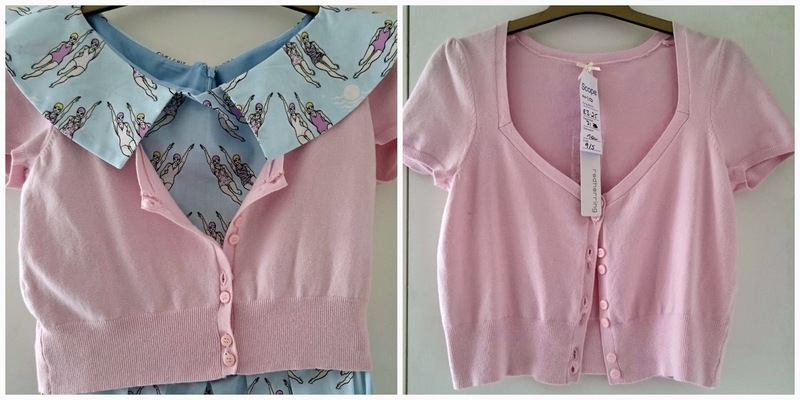 My last find in Scope was this baby pink cardigan. Yes, you heard me right…baby pink. I’m not a pink girl, especially not baby pink. 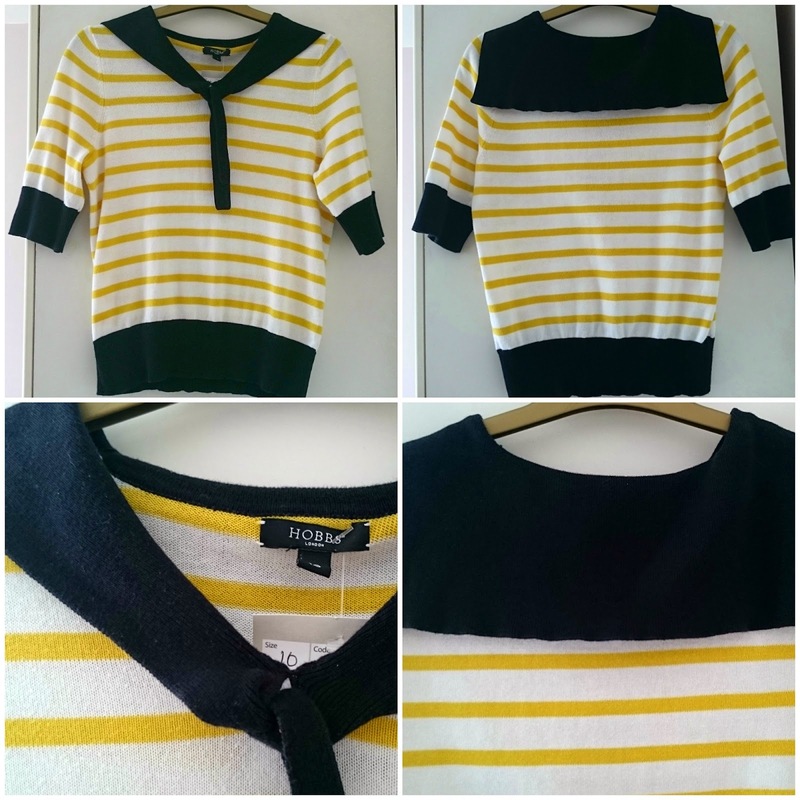 However, I have been on the hunt for a cardigan to match the dress for my friends’ wedding in July. At £3.25, this brand new with tags Red Herring cardigan will do nicely, thank you. My final purchase of the morning was something I almost left behind. A deep blue trench coat made by Dahlia. It’s clearly an older style as the Dahlia label is very different to the ones we see today. Hanging on the sale rail for £3, it wasn’t until I tried it on that I realised it was missing three buttons. I considered swapping all the buttons for something a little brighter, then realised with a rejig, I could use the existing buttons. Although it will need a good wash and press, again, I decided to take a risk. So, there you have it. One weekend, six purchases, £27.94 donated to worthy charities. I’m learning to be less cautious, buying things that will need altering, pressing, washing, all of the above. However, I’m looking forward to wearing all of these new clothes, so that’s a sure sign of quality buys? Right? How to EBay #1 :: Let’s Get Ready to Sell, Sell, Sell!